I turned 30 over the summer, and had a horrendous revelation of how much I have been neglecting my body. Not only was I not exercising, but my eating habits were less than stellar. And, it wasn’t so much that I was eating junk food, but more of my lack of portion control and my indulging in grandma’s scrumptious home-cooked meals. So, my revelation basically told me that if I want to look bangin’ hot like Jennifer Lopez, my lazy self has to step it up with eating healthy and exercising. And, let me tell you, this is no easy task. I for once HATE exercising, I hate sweating, I hate cardio, I hate everything that has to do with working out. At one point in my life, I tried “Insanity” and failed miserably. I do remember a point in my life when I liked exercising, and that was back in high school when I used to swim every day. And, yes, I could take on swimming every day, but, unless you have a house with a pool, finding a good pool for lap swim is not that easy. If you do find one, the available times might not work with your schedule. Anyway… on this quest to healthy eating, I was left pondering as to the best approach to stick to my plan and include some exercising in it. I made a pact with two of my girlfriends that we would hold each other accountable for what we eat, and how much we exercise. I felt so determined that I even enrolled at one of my friend’s gym, and she is now my work-out partner. Now, the eating part… I am always on the go; I always rush out of my house in the morning to get to my office. I knew that managing to get a good breakfast & a healthy dinner would be easy, but my problem has always been lunch, what to eat, where to eat, do I make it at home, do I go out to eat…ahhhh! Decisions! Decisions! A colleague of mine mentioned that she had started buying the pre-packaged salads from Trader Joe’s. 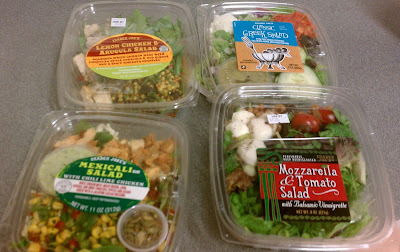 And, while I am not a huge fan of pre-packaged anything; I decided to give the salads a try. Oh, was I in for a HUGE surprise - there are so many varieties that it is nearly impossible to get bored. I figured that I would buy my week worth of salads and see if I like them. 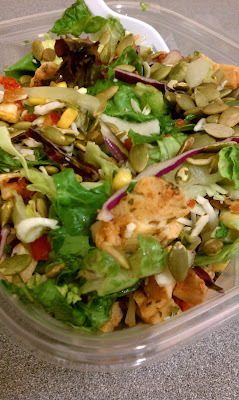 Well, today I had the Mexicali Salad with chili lime chicken – yummy, flavorful & fulfilling! I am actually excited to trying out the ones that I bought for the rest of the week, and perhaps stick to making this my go-to lunch for the next few months. Of course, I know that the best thing would be for me to prep my own salads, but I know that I am not alone when I say that it is hard, especially when you are always running around like a headless chicken with a million things to do. For now, this is a tremendous step in sticking to a healthy eating plan while I figure out what else works for me. So, people of the internet, don’t fret! Trying to change unhealthy habits is hard, but, it takes baby steps, and the satisfaction from looking in the mirror and seeing yourself transform it's oh so worth it!